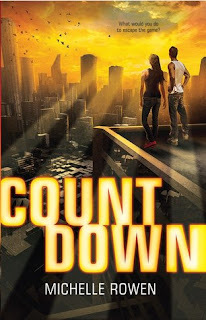 Since her parents were brutally murdered two years ago, Kira hasn't had things easy as she tries to survive on the streets of a city decimated from the plague. But she's managed even when she's had to resort to some pretty extreme methods. But all that changed when she wakes up chained in a room next to a teenage serial killer and in the middle of a life or death game where she has to depend on him. But one terrible secret threatens to unravel them at the seams. In a battle for survival as the navigate a twisted man's game, Kira will have to learn to put the past behind her, or it will cost both their lives. I absolutely adored Rogan's character as he was really the star of the show. Don't get me wrong, it's not that Kira was so bad, it's just that she didn't come across so strongly to me, despite being the narrator. Rogan has endured so much and while I won't spoil the revelations, I will say that he's not as he seems. I have to say the best part of the book was watching him through Kira's eyes, especially with each new revelation that leads to a massive stumbling block in their path towards trust and acceptance, and then perhaps a bit more. The attraction between these two was so incredibly strong, that at times it became a battle of wills between their hormones and their heads, and then later their hearts. I really enjoyed getting them to see their journey together as they navigated through the incredibly horrible circumstances they were thrown into. I think very few could have come together the way they did, especially considering just how shocking some of the revelations were. Come to think of it now that I look back over the book, I realize that Kira was a pretty amazing character as well. When you really think about what she has overcome in the past and then the fact that she even gave Rogan a chance at all is pretty incredible. Trust me, with each new blow that they overcome, you'll find yourself falling in love with this pair over and over again. Which honestly makes for the best kind of romance in my book. The world behind COUNTDOWN was rather interesting, yet underdeveloped. It was a mix of post apocalyptic, dystopian, and sci-fi. At times, especially towards the end, the blend of all these elements was almost overwhelming, but luckily it still flowed rather well. That being said, I'm not sure it was quite fully developed enough for my tastes. But again that was probably do to the large mish-mash of elements that seemed out of left field at times. I guess I just feel like there was a whole lot of potential there, and since it really only skimmed the surface of it I was left feeling a bit disappointed. COUNTDOWN was an incredibly fast paced read that was slightly reminiscent of the Hunger Games due to the survival game aspect. However it was a bit different as were forced into a life or death game that required learning to trust and depend on their partner rather than an every man for themselves mentality. While I will say that the issues and the style of writing was no where near as deep as the Hunger Games, but honestly that was okay, because sometimes you just want to read to be entertained with something a bit lighter, yet still have the suspense of the high stakes. This could have been a solid 4 star read for me, but missed that mark due the lack of formation in the world building. Even so, I enjoyed the read and would be interested to see more from this author in the future.